HERBERT WHONE, born in Bingley, West Yorkshire, led a double life in the art world from an early age. He was taking photographs in 1942 at the age of 13. He was awarded a county scholarship to the Royal Manchester College of Music, where he studied the violin under Henry Holst. After three years’ war service in the RAF he concluded three more years’ study at Manchester University and was awarded the College ARMCM, along with the university’s Mus.B.Hons. 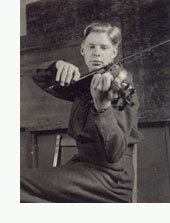 His first professional job was as leader of the Summer Season Orchestra at Bridlington. They were years broken by study of the violin in Paris. Following this he joined the Covent Garden Orchestra (one year) and subsequently the BBC Symphony Orchestra (three years). The year at Covent Garden gave rise to the first art-work that could be spoken of as art. A series of drawings illustrated a book written by Jeremy White, lead viola of the orchestra, a dry but acute comment on orchestral life and its rituals of the time. Unfortunately the book remained unpublished. Some of the drawings and captions of the book are shown in the beginning of the website. They encapsulate the two aspects of his creative life at the time. After leaving the BBC Symphony Orchestra Herbert Whone joined the Scottish National Orchestra in Glasgow, where he remained for nine years, seven of which as Deputy Leader. It was here that his artistic work began to flourish day by day – indeed, he fell in love with Glasgow and its character. Initially his subjects were musicians in his immediate circle of players, but the Glasgow scene predominated and one-man shows came to be common features in Glasgow. As proof of this prolific output, in 1995 Colin Baxter published the images in book form under the title Glasgow in Transition. Two other books followed this one, also from Gollancz – The Hidden Face of Music and The Integrated Violinist, a follow-up to the first book on the violin. During the time of writing these books Herbert Whone was leader for twelve years of the Guildhall Orchestra in York. He also gave teaching demonstrations based on the ideas in the books, mainly to groups of students and teachers, frequently for ESTA. 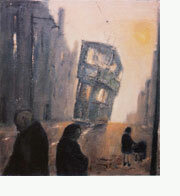 In the world of art he turned to painting a unique landscape of the West Riding, then beginning to lose its character through the disappearance of lamp posts, mill chimneys and stiles. 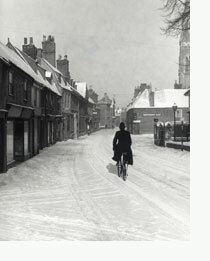 Around this time he was also collating black and white photographs of the same landscape, which were eventually published under the title The Essential West Riding (Smith Settle, 1987). In both these enterprises he drew upon the impressions from his childhood in Bingley. This applied equally to a small book of poetry called Snapshots from Childhood, printed privately in 2000. With a move from Huddersfield to Harrogate, a new theme began to emerge. He became a guide for the National Trust at Fountains Abbey, holding the position for the next fifteen years. 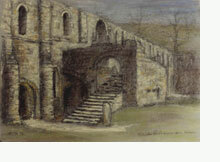 Joining academic knowledge and artistic sensitivity, he held two exhibitions at Fountains Hall, in 1995 and 1987. The seasonal changes of atmosphere and constant change of coloration of the sandstone of the Abbey caused him to change to the medium of pastel for the first time in his painting career. At the same time he published a black and white collection of photographs along with documents relating to the Abbey under the title Fountains Abbey (Smith, Settle, 1987). In keeping with the religious tenor of the Abbey, Herbert Whone also produced a book called Church, Monastery, Cathedral (Compton-Russell, 1987), which can be seen as a handbook for visitors to Christian monuments with a special reference to the symbolism of church furnishings. Various collations of work in book form can be found on this website under Unpublished Work. For example, a collection of over 100 drawings made in 1980 and called ‘Drawings from Life’ was the result of spontaneous sketches made in cafes and trains made over a period of three years, giving much pleasure to the artist, but providing a challenge as to how portraits can be done unbeknown to the sitter at such a close range. The artist concluded that three seconds is the longest time attention can be focused on the sitter without being found out. A constant fascination in the seventies and eighties was in trees. 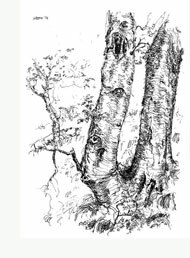 The first exhibition was in Harrogate Art Gallery in 1983 consisted of pen drawings and photographs of trees, showing their remarkable and often anthropomorphic shapes. Trees have since been used in various forms and in miscellaneous exhibitions over the years. A high point of Herbert Whone’s fascination with trees came with the book Touch Wood (Smith, Settle, 1987). The book contains the same anthropomorphic images – 200 black and white photographs joined with poems and literary quotes from many sources. At that time Herbert Whone had two marathon projects slowly moving towards fulfilment. The first was the deeply felt need to create a comprehensive and beautiful book on Fountains Abbey (apart from the black and white one published by Smith, Settle in 1985). To achieve such a book three aspects of the Abbey needed equal consideration: a) important architectural features; b) the unique atmosphere of changing seasons and coloration of the sandstone and c) 400 years of the Abbey\s history. For the history HW decided to use the Fountains Chronicle, a contemporary history translated from the Latin and covering the first 200 years. Thus, words and Herbert Whone’s photographic work were equally distributed. But the problem of the cost of publication became immediately obvious and in the end when the National Trust itself declined to publish on similar grounds, the author shelved the project as impracticable. A few copies, however, were privately printed and donated to certain bodies – ie the National Trust Library in London, the Harrogate Reference Library, the York Minster Library. The author hoped that through the book he might reach the ‘spirituality’ he had so often heard about during his tours with visitors. Another marathon artwork was given the title ‘Unpremeditated Masterpieces’, a set of abstract colour photographs taken between 1995 and 2002. The title indicates the fact that each image was seen as a masterpiece in its own right without any human assistance – it had been seen and recorded immediately by the pressing of trigger. The only human interference was a later joining the images in twos according to their shape, colour and content. Despite this, each image was seen as independently perfect. In this process the author could scarcely claim much responsibility. At this time he was also compiling a photographic marathon project – entitled ‘Best 600 Black and White Photographs’ – a selection from many photographs taken by the author between the age of 13 and 33. Those chosen from the 600 for inclusion in the website have been carefully chosen: they reveal the important fact that the eye was seeing and discriminating in the same way at 13 as it was later at 33, or even later at 63. The equipment may have been primitive but the selection and the arrangement of subject matter was instinctively ‘right’. Between 1990 and 1998 Herbert returned for his inspiration to Glasgow, rewalking the old haunts of the sixties, recovering the magic and the unique character that made the city what it was. This was achieved by photographic collages which could rightly be said to be found nowhere else in the country. The collection was called ‘Vanishing Art Treasures of Glasgow’. Despite the passing years, he still likes to feel that these images have a place in the history books of his first love, Glasgow. The ultimate identification with a theme was with water. Studying running water was an elusive attempt to capture its lightness, heaviness, slowness, speed and all those other mysterious aspects of water. Again, pastels seemed to be the appropriate medium – not too thick, not too flimsy as in oil and watercolour. Two exhibitions were held, in 2002 and 2005, at Nunnington Hall, North Yorkshire. 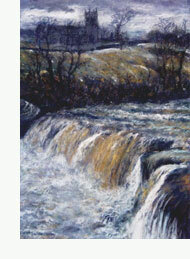 In 2006, waterfalls, specifically Yorkshire ones, became a part of a body of work constituting a retrospective exhibition covering all periods of his creative life. It was held in the Mercer Gallery in Harrogate under the title ‘A Life in Art’. The artist felt that the mystery of water was an appropriate way to end his life in art.